I was invited to an informal drinks party in France some years ago – very bohemian and right up my street (or up my alley as you say in America). The wine was served in an assortment of glasses and the only canapé that was served was chickpeas tossed in olive oil and cumin. So simple and so delicious! I cook so many different types of food these days that I tend to forget some of the dishes I used to love and cook – until I see a recipe that reminds of what I used to eat, like these chickpeas with cumin. 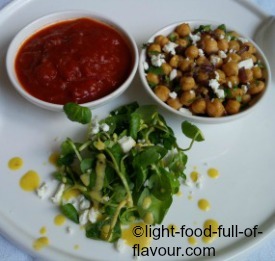 I admittedly add some more things to my chickpeas, and serve them together with other things – tapas style. A nice combination, I find, is to eat the chickpeas with cumin together with some kind of tomato sauce or salsa, roasted root vegetables like squash, carrots, sweet potatoes and a salad. This will make for quite a substantial meal. You could skip the roasted vegetables if you wanted a lighter meal – and for a more fiery meal, serve with a tomato chilli jam. 1. If you are roasting vegetables, then get them going in the oven first. Make the tomato sauce. Place the oil and chopped onion in a pot over a medium heat. Gently cook the onion, stirring every now and then, until it starts to soften but not brown, approximately 5 minutes. Add the crushed garlic and cook for a further minute, stirring and making sure the garlic doesn’t burn. 2. Add the chopped tomatoes, tomato paste, balsamic vinegar, water and season with salt and pepper. Stir and bring to a simmer. Let it simmer for about 15 minutes. 3. While the sauce is simmering, add 2 tablespoons olive oil and the chopped onion to a frying pan over a low heat. Stir and fry for about for about 7 minutes, until the onion is soft. Add the garlic, cumin and chilli flakes (if using) and continue to fry for another couple of minutes – making sure the garlic doesn’t burn. 4. Add the chickpeas to the frying pan, season with salt and pepper, stir together and as soon as the chickpeas are warmed through, take the pan off the heat. Place the chickpeas in a bowl and stir through the chopped feta cheese.